Long-established American families have family trees that stretch back to the Colonial Era in the 17th and 18th centuries, before the United States became an independent country. Finding vital statistics and other genealogical information about these early Colonial ancestors from that time period can be difficult, as some vital records simply were not officially kept before and during the 1700s, or have been destroyed through war, accident or the passage of time. That is why genealogists today depend on Colonial newspapers or early American newspapers for a reliable source of historical information. 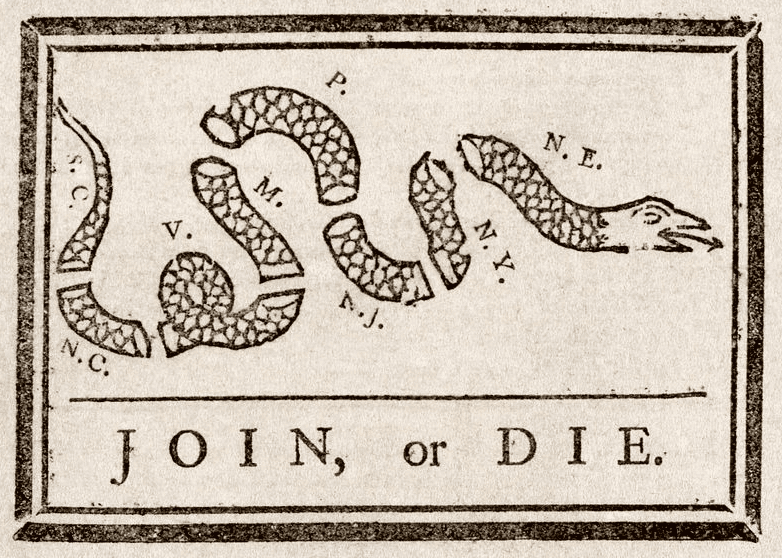 Illustration: 1754 political cartoon by Benjamin Franklin urging the British Colonies in North America to join together to help the British win the French and Indian War (the segment labeled “N.E.” stands for the four New England colonies). Credit: U.S. Library of Congress, Prints and Photographs Division. Fortunately, GenealogyBank offers a rich genealogy resource for family historians tracing their family trees back to American Colonial times: an online collection of 27 Colonial newspapers, providing obituaries, birth notices, marriage announcements, and personal stories to get to know your pioneering ancestors and the times they lived in better. Just one Colonial newspaper can open up a world of information, leading to important historical findings and untold secrets of your family’s history. 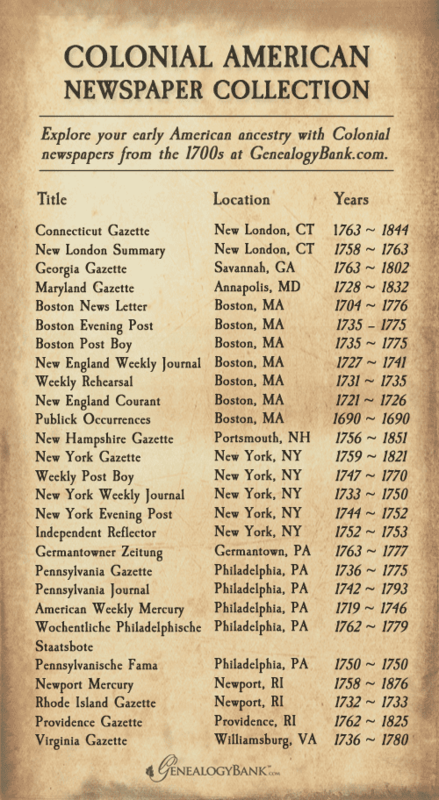 Discover a variety of historical genealogy records and news stories in these 27 Colonial newspapers, listed alphabetically by state and then city. Search the Colonial newspaper names in this list by clicking on the title to be taken directly to the search landing page for that publication. There, you can begin researching your Colonial ancestry by ancestors’ surnames, dates, keywords and more. Additionally, download our printable PDF list of old colony newspaper titles for easy access to our historical archives right from your local desktop. Click the newspaper titles to be taken directly to the search landing page for that publication. Just click on the list below to start your download. Feel free to embed our list of 1700s newspapers on your website or blog using the code below. Simply cut, paste and presto! You can easily share this fantastic collection of early Colonial newspapers and early American newspapers with your visitors in no time at all. Got Pilgrim ancestry? Make sure to follow our Pinterest board about Mayflower Genealogy for tips on tracing your Pilgrim ancestry. Civil War’s Last Rebel Town Finally Rejoined the Union—in 1946!